Today in Masonic History Daniel Gould Fowle is born in 1831. Daniel Gould Fowle was an American politician. Fowle was born on March 3rd, 1831 in Washington, North Carolina. He attended Bingham Academy where he finished first in his class. He then went to Princeton where he graduated in 1851, before going on Richmond Law School. After graduating from Richmond Law School he opened a practice in Raleigh, North Carolina. As the American Civil War approached, Fowle was opposed to secession, despite this fact he joined the North Carolina Militia as a private. Before long he was made a major in the commissary branch. He resigned that post to help raise the 31st Carolina infantry regiment. He was appointed lieutenant colonel of the regiment in 1861. In February 1862, Fowle was captured along with the regiment on Roanoke Island, he was released two weeks later. After his release he failed to be elected colonel of the regiment and resigned from the Confederate Army. In October of 1862, Fowle was elected to North Carolina State legislature. In March of the following year he was appointed adjutant general of North Carolina with the rank of major general by Governor Zebulon Vance. It was a short lived position, by fall of 1863, Fowle had a disagreement with Vance and resigned. In 1864, Fowle was reelected to the legislature. In 1868, Fowle was elected chairman of the state Democratic Party. In 1880 he ran unsuccessfully for governor and in 1884 ran unsuccessfully for the United States Congress. In 1888, Fowle was nominated by the liberal wing of the Democratic Party for governor. This time he was successful and took office in January of 1889. 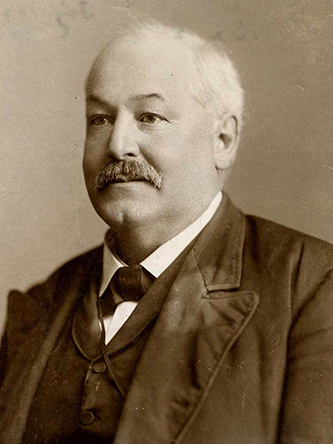 During his time in office he created a railroad commission to protect farmers and advocated for women's education. Fowle passed away while in office on April 7th, 1891. In a more pop culture reference, it is claimed that from time to time the ghost of Governor Fowle has haunted the North Carolina Governor's mansion. Fowle is listed as a member of Hiram Lodge No. 40 in Raleigh, North Carolina. It appears that Hiram Lodge was not the lodge he was raised in and there seems to be no record of his previous lodge available. In January of 1891, Fowle invited members of the Grand Lodge of North Carolina to attend an informal reception at the Governor's mansion. Fowle was also a member of Raleigh Chapter No. 10, Royal Arch Masons.